New menu items aren’t automatic. Students are invited to give their feedback via iPads after trying potentially new menu items made by CNS staff. Called Adventure Bites, these taste tests are conducted by EATS volunteers at all seven schools. If at least 75% of students like what they tasted, it gets added to the lunch menus. The goal of including students in the process is to empower them to decide what food they are offered at school, to increase their awareness of the new menu items, and to reinforce that healthier food means healthier bodies. As part of the Adventure Bites, nutrition education is on ingredients and their benefits are relayed to students. 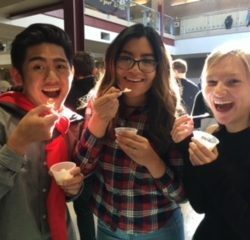 Adventure Bites will be conducted through the rest of the school year at all seven Park City schools. If you would like to volunteer and come see the program in action, please complete the volunteer request form or contact eatspc@gmail.com. For a list of upcoming Adventure Bites, click here. 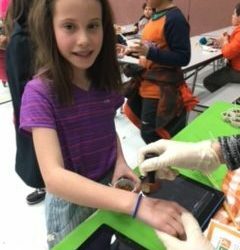 Adventure Bites is brought to our schools by Child Nutrition Services.